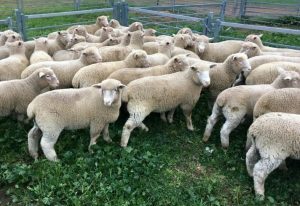 These March-April drop Poll Dorset cross lambs, 18.7kg and score 3, at Nangus, NSW, sold for $120 on AuctionsPlus last week. DRIER seasonal conditions have reduced clearance rates of sheep and lambs on the online livestock sale platform AuctionsPlus. AuctionsPlus market operations officer Alex Hearn said sheep and lamb numbers increased again last week by 3371 head to 68,516 head, a clearance rate of about 45 percent of stock offered. Ms Hearn said feedback from many AuctionsPlus assessors across the eastern states indicated the main factors influencing the market are the dry seasonal conditions and smaller lot numbers, which are having a direct impact on ease of transport. She said online sheep and lamb clearance rates have been below 50pc for the past three weeks. Young Merino ewes sold for an average of $146 and to a top price of $200 on AuctionsPlus last week. The top price went to two lines at Angas Valley, South Australia. These were a line of Hilton Heath blood, 14-15 month-old ewes, weighing 54kg lwt, with a 1.5” fleece, and some 26-28 month-old ewes, bare shorn and weighing 56kg. Proven Merino breeders made an average of $136 and sold to a top price of $152. This top price was paid for a line of four year-old Inglewood blood ewes weighing 46kg and with a ¾” skin, at Tooborac in Victoria. These ewes had been scanned in-lamb to Poll Dorset rams. Older Merino ewes made an average of $115.50 and sold to a top price of $130 for three lines last week. The first was a line of six year-old ewes weighing 56kg and with a 1.5” fleece, at Walgett in New South Wales. These ewes had been scanned in lamb to Border Leicester rams. The second line was some Mulloorie blood, 5-6 year-old ewes, weighing 66kg and with a 1” fleece, at Broken Hill, NSW. These ewes had been station mated to Mulloorie blood rams. The third $130 line was some Toland and Leachim blood ewes, 6-7 years-old and weighing 63kg, with a 1.75” fleece, at Beechworth, Victoria. Merino wether lambs last week averaged $95 and sold to a top price of $118. The top price was paid for a line of Stud Park South and Edgarley blood wethers, August/September 2016 drop, weighing 41kg and with ¾” skin, at Willaura, Victoria. First cross ewe lambs sold for an average of $206 and up to $294. The top price was paid for a line of 9-10 month-old ewes, weighing 55kg at Cooma, NSW. The ewes had been scanned in lamb to Poll Dorset rams. Another line of 11-12 month-old first cross ewes weighing 54kg at Birregurra in Victoria sold for $267. These ewe lambs had been scanned in lamb to White Suffolk rams. Ewes and lambs last week made an average of $196 and sold to a top price of $289 online. The top price went to a line of Ridgeway Advance blood Poll Merino ewes, with 1-2 month-old White Suffolk lambs weighing 31kg, at Bordertown, SA. The five year-old ewes weighed 76kg and had a 1.75” fleece. Other highlights on AuctionsPlus last week included a line of composite ewe lambs at Moutajup, Victoria, that sold for $261. The 12-13 month-old ewes weighed 65kg and had been scanned in lamb to Southdown and composite rams.